Well, that seems to be the pattern. It was raining when we woke, but after excellent breakfast of bottomless everything (cost $A5 each) it stopped. Our crops of today were wheat, sunflowers (many of these), vineyards, yellow capsicums (these are included in breakfasts), cauliflowers (remains of the harvest gently scenting the air), apricots, pumpkins. In a small town we found Supermarket Flop which had extensive meat paste and rye bread sections as well as toothpaste. 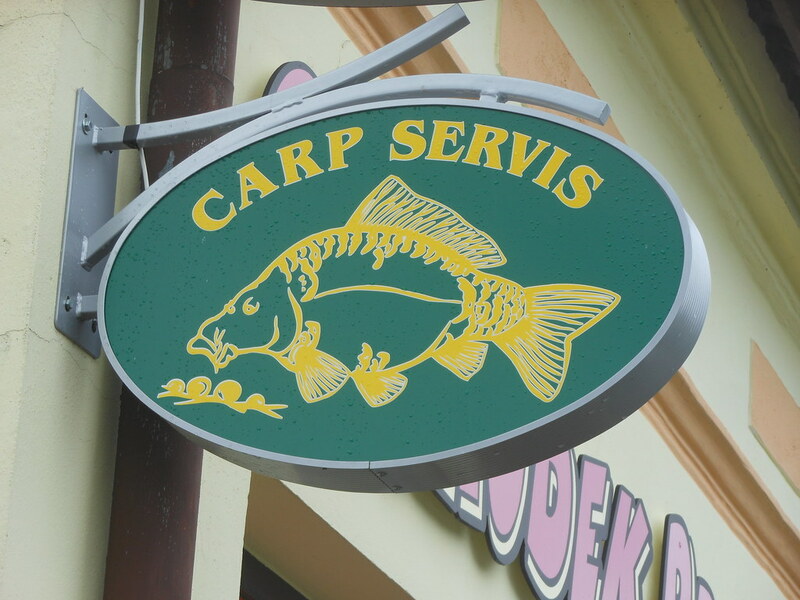 Over the road was a pet supplies shop advertising Carp Servis, obviously for carp lovers. I say carpe diem to them! So far no carp on our menus. Puncture goblin is back – Ian still 9, me now 1. As we stopped in Hevlin to attend to this we met another cycle tourist, Pattie from Portland, Oregon, on an old style black Bike Friday (New World Tourist) that she bought second hand. She is on a 2 month jaunt and she rode along with us for awhile until our ways parted. 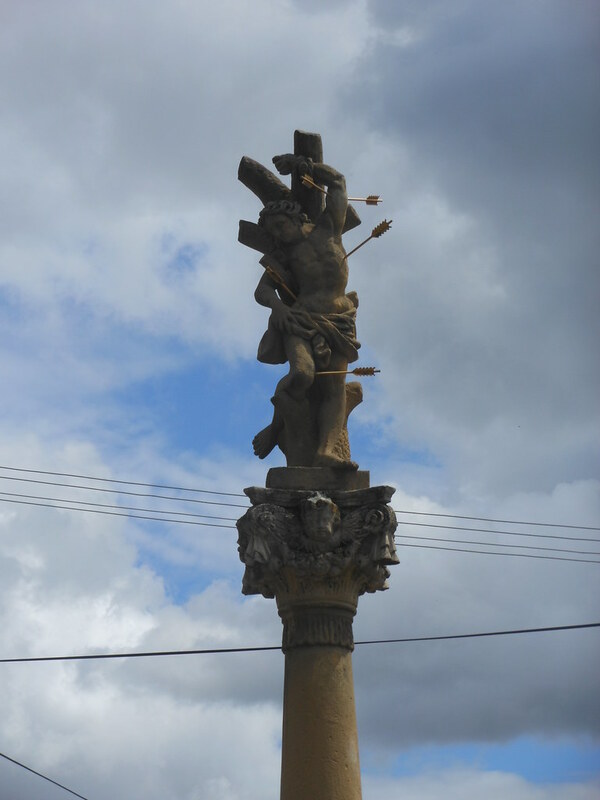 St Sebastian punctured by arrows from all sides was the feature of Hradek. Coffee (gritty) and the cheese sandwiches that we surreptitiously made at breakfast were the feature of Jaroslavice. From our destination, Znojmo, we can just see Mikulov far off on the horizon. Znojmo is an ancient town with many náměstí (squares), churches, a castle, a river, narrow cobbled streets, underground passages, towers, geraniums in window boxes and a big Bata shoe shop. I went for a walk through a park and was reprimanded by a policeman for walking on the cycle path when I should have been on the pedestrian path. There were scarcely any other people walking or cycling, but I’m trying to stay out of trouble so moved across as directed. 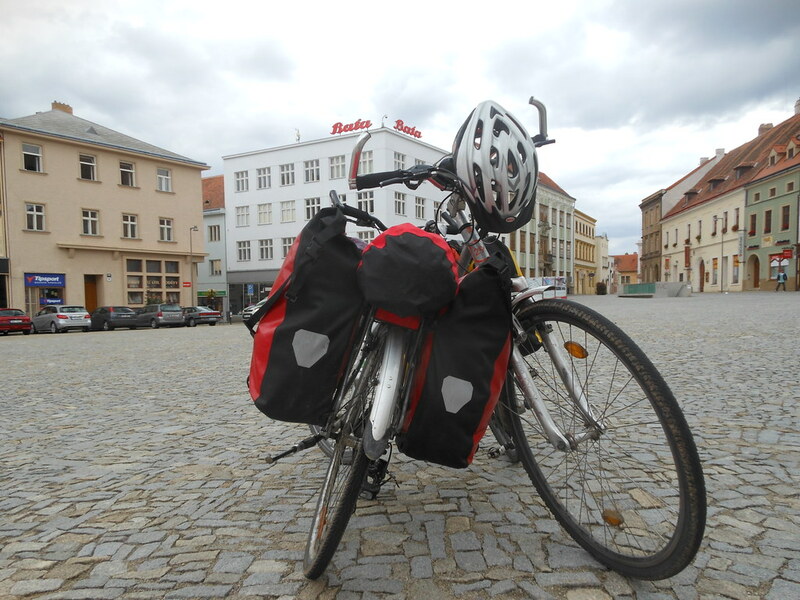 Mikulov – Znojmo by ianwroberts at Garmin Connect – Details. This entry was posted on 22 July 2012 at 7:32 pm and is filed under Czech Republic. You can follow any responses to this entry through the RSS 2.0 feed. You can leave a response, or trackback from your own site.